The discovery last week of water ice just under the surface ofMars has researchers buzzing, given that water is a key ingredient for life.The finding, by the Phoenix Mars Lander, is the most recent hint that the RedPlanet might be habitable to microbes. But in the parlance of treasure hunters in the movie ?NationalTreasure,? this looks a lot like just another clue that will lead to otherclues, and still more clues. The big question still hangs over NASA: Is there lifeon Mars? And just as important: Can NASA ever find the evidence for it? Getting to that answer will require the right mission with theright tools in the right places — not to mention some serious digging beyondthe capabilities of Phoenix. 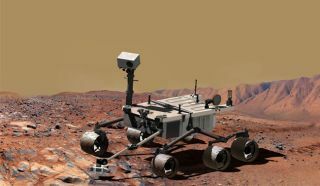 The next Mars missions include NASA?s Mars ScienceLaboratory, an SUV-sized rover set to launch in 2009, and the European ExoMarsrover that would wield a drill capable of digging 6.5 feet (2 meters) down. Itis set to launch in 2013. NASA has long taken an incremental approach to searching forbiology, with "follow the water" as a driving strategy. That means,perhaps to the frustration of some, that the current Phoenix lander mission andthe twin rovers on Mars are not even designedto detect Martian life. So current and near-future missions may not directly look forlife, scientists say, but they will likely turn up more pieces to the puzzle ofMars and where extraterrestrial life may thrive. Scientists generally agree that finding existing or previous lifemeans digging down at least a meter, away from the harmful radiation on thesurface of Mars. The Phoenix lander has scraped away enough of the surface touncover crumbsof water ice, but its backhoe-like robotic arm cannot reach down far enoughto try and find whatever life may exist under the north polar region. ?Phoenix could easily be sitting a meter or two above pay dirt,?said Michael Storrie-Lombardi, an astrobiologist who heads the Kinohi Institutein California. A serious search for life would likely move further up towards theMartian north pole, where the presence of ice water that sometimes melts wouldprovide the best chance for life to eke out an existence. However, the melting and refreezing of water could also eraserecords of previous life or organic material, scientists say. That presents adilemma between searching for existing life versus past life. ?We don?t know exactly how fast the ice comes and goes,? said JackFarmer, an astrobiologist at Arizona State University. ?If it?s on a routinebasis, then you may end up losing the biosignatures.? Farmer and other scientists may prefer a region that remainsfrozen year-round, preserving organic material and possible traces of past lifein the ice. That safer bet on finding evidence of past life — or at leastpreserved organic material — means going to places ?that are fairly dry and actlike a freeze-dried container,? Storrie-Lombardi told SPACE.com. But ?if you really want to go for broke? and search for existinglife, Storrie-Lombardi said, you need to dig in places where water may flow. Besides areas near the Martian north pole, scientists have alsoexamined gullies where liquid water may have bubbled up recently in theplanet?s history. Finding an active hot spring could lead to finding lifesimilar to extremophilebacteria that can thrive under intense conditions. ?Hot springs are at the top of my list,? said Bruce Jakosky, ageologist at the University of Colorado who has worked on Mars missions. ?Organisms might notsurvive and thrive on the surface, but recently exposed hot springs might bringsomething up from beneath.? Both NASA?s MSL and the European ExoMars rovers can explore theMartian surface more effectively than Phoenix, and the ExoMars rover will alsocarry a heavy duty drill to dig for biological gold. But both rovers still facethe challenge of knowing where to look. ?We don?t know what the recipe is for success, or the paradigm forpreserving life on Mars if it ever evolved,? said John Grotzinger, geologistand MSL project scientist. He emphasized that finding preserved organicmaterial is no cinch, and pointed out the rarity of uncovering fossil recordsof early life on Earth. The mega-roverMSL will scoop up dust and drill into rocks to test for organic buildingblocks of life such as carbon, hydrogen, nitrogen and oxygen. MSL will alsocarry a laser to vaporize rock samples and allow it to sift through theresulting dust. Grotzinger and the MSL team aim to boost MSL?s chances by choosinga landing site with a diverse environment, including areas with signs of waterand minerals such as clay and sulfates that could preserve organic material. ExoMars holds the additional promise of allowing scientists to digdeeper than ever before on Mars, and presents possibly the best chance offinding solid evidence of existing or past life. However, not knowing what liesbeneath the Martian surface tempers optimism for finding life during thenear-future missions. ?I?m going to give the next two rovers a 50-50 chance,? Storrie-Lombardisaid. ?Once we go deep it?s a whole different game.? An additional instrument may improve the odds for MSL or ExoMars.Storrie-Lombardi worked with U.S. and U.K. researchers on a small laser thatcan make organic compounds glow fluorescent under its ultraviolet beam. The laser probe could illuminate holes dug by ExoMars to see whichareas glow the brightest. That would allow scientists to target those placesfor testing with more limited-supply wet chemistry tests, which mix soil androck samples with water or other reagents to identify what building blocks oflife might exist. "Ifthe team can show this is light and rugged enough, we will propose taking it toMars,? said Andrew Coates, planetary scientist and ExoMars investigator. When NASA?s Viking mission reached Mars in 1976, the twin landersuncovered no traces of organic material in scooped-up Martian soil. A studylater found that the tests used by the Viking landers even failed todetect organic material on Earth in places teeming with microbes. Much has changed since then besides having more sensitiveinstruments. Scientists now know much more about the Martian environment andthe likelier hiding holes for life, thanks to the long list of Mars missionsleading up to Phoenix. ?Phoenix, Mars Science Lander, these all have a chance ofdiscovering life,? Jakosky said, ?but that?s not the goal of the missions.? NASA?s incremental approach can appear frustratingly slow to evenscientists. But Jakosky explained that each mission has made new and differentdiscoveries that add to overall understanding of Mars as a system — and thathelps narrow the search for life. ?Organicscan be produced by non-biological processes, and indicators of life on Earthmay not be indicators of life on Mars,? Jakosky said. ?In order to know how tointerpret any measures we make, have to look at Mars as a system.? By contrast, Viking represented a shot in the dark without any ofthat understanding. ?Wetried the cash in all your chips approach, and that was the Viking spacecraft,?Jakosky said. ?It was an incredibly naive, narrow-minded approach, and inhindsight there?s no expectation it should have found life.? MSL and ExoMars should help clarify questions about where to findorganic material and possibly life on Mars. However, robotic explorers can onlyprovide test results and images to humans back on Earth, which leaves room openfor debate about what exactly they have found. ?We might have to wait to bring a sample back or send a humanthere,? Storrie-Lombardi noted. ?It?s sometimes difficult to come up withconcrete evidence that everyone agrees on.? Getting a Mars sample back to Earth would mean scientists couldexamine the evidence with all the most recent instruments and technologyavailable, instead of just the limited experiments that each Mars mission cancarry. Jakosky agreed that scientists are ?probably not getting definitiveanswer until we bring a sample back,? a possible but complicatedmission proposal. ExoMars includes plans that would test technology for such futuresample-return missions, and MSL will similarly ?take us a long way towardsdetermining what are the favorable rocks to bring back,? said Grotzinger on theMSL team. For now, scientists remain cautious but hopeful about the questionof life on Mars — and above all excited. ?I think it?d be stunning if we don?t find evidence that there islife or was life in the past,? Storrie-Lombardi said.